Highest rank # 1 in Mystery/Thriller! Written on Wattpad and now published worldwide in print and eBook (in ePub and Kindle) at the usual retailers! After 4 years teaching in central Africa, Caitlyn Lancaster returns to her family in Australia, telling them she's been sent home because of looming political unrest. But Cait is more fragile than she and her Federal police handler anticipated. She's forced to accept that childhood family friend, now police detective, Riley Duncan must be told the brutal truth if she is to keep herself and her family safe. Putting her faith in her handler, Cait takes the ultimate risk only to discover that Agent Koffa has failed to take into account one vital detail...he's not as good at his job as he thinks he is. 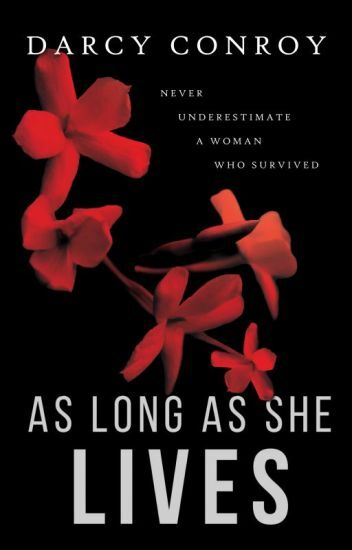 ** Please note, rather than the original, unedited draft, this book is now a sample of the first three chapters of the published version of As Long As She Lives. The draft version to which so many of you lovingly responded was available here for over two years and I cherish every reader and all your support but having the unedited draft available here was beginning to affect other opportunities as I attempt to establish a career in this fiction writing game. Also, I'd prefer that the version of the work that is publicly available is the best version! Again, thank you all so much for your support, I look forward to sharing my next novel in the draft stage soon! ©Narrative Disorder 2014 - All rights reserved. Divorce a husband, lose a career ... grapple with a murder. TV journalist Elizabeth "E.M." Danniher will tell you she committed two sins - she didn't stay young, and she made an enemy of a powerful news executive - her ex. She used to break national news. Now her top story as the "Helping Out!" reporter at dinky KWMT-TV in Sherman, Wyoming is getting a refund for a defective toaster. Tough, funny and determined, Elizabeth wrestles with isolation, keeping a professional edge, and an evolving self-image. Is Wyoming - the land of cattle, cowboys, tumbleweeds, and fewer than six people per square mile - her new home or a road to permanent obscurity? Soon she's in a battle of wills with ex-football player turned journalist Mike Paycik, who sees her as a handy rung on his career ladder. And there's the matter of a deputy sheriff-missing or murdered? Elizabeth finds herself investigating at the insistence of a girl who's set on proving her father's innocence. Not that enigmatic rancher Thomas Burrell makes investigating easy for an amateur detective. But Elizabeth won't fade to black without a fight, no matter how final some might want to make her SIGN OFF. "This is one of those books that you want to stop everything to read while hoping it never ends." "Be prepared for lots of twist and turns." "I read it in one sitting. I hadn't planned it that way, but just couldn't stop." "The characters were a mix of funny, sad, and quirky and were totally believable. There was just enough humor to lighten the story, but not to disrespect the seriousness of crime." Now a Featured Wattpad story! Imlon Held, Astronomer Royal, is on the edge of the greatest discovery in the history of astronomy. His new invention, the telescope, has revealed to him a startling sight. Can the stars truly be moving? Isendrin Held, Lord General of the West, has reached the peak of his soldiering career. A legion follows him, the western provinces trust him, and their rulers seek his counsel. But politics will wrench it all from his grasp. A Dream of the Heaven follows the brothers away from their homeland and into the darkness of exile. Imlon must discover the truth behind the wandering stars. Isendrin must find his place in a world that does not want him. Both must confront their deepest fears and a mystery that threatens to engulf all they know. An epic fantasy with a scientific twist, A Dream of the Heaven is the first part of a planned trilogy. Everything changes when a fatal traffic accident well outside Mapleton seems connected to elderly Rose and Sam Kretzer, two of Mapleton's most beloved citizens. The arrival of Megan, the Kretzer's grown ward, and Justin, their grandson add to his troubles when Megan is mugged. In addition, Justin is renovating his grandparents' house despite their objections, and then someone breaks in and the house is ransacked. When Gordon ties the car accident to a grisly murder in Mapleton-the first anyone in town can remember-he's afraid he's into more than he bargained for. Tristan Tomkins is a translator for the British army during World War 2, in Nazi occupied France. During a routine recon assignment, Tristan's entire regiment is massacred by German forces. Finding himself defenceless, alone and surrounded by the enemy, he is forced to infiltrate the German army to survive, after killing a German soldier and assuming his identity. Armed with the soldier's diary, strong competency in the German language and very little else, Tristan finds himself deep in enemy territory with only his wits and courage to help him survive. He immediately comes under the suspicion of his superior officer, and must stay one step ahead of him to stay alive. His consistent attempts to reunite with his battalion are constantly thwarted by bad luck and misfortune, leaving him at the whim of fate and chance. Will Corporal Tomkins survive this ordeal? , or will he ultimately be discovered as an impostor? This an edge of your seat thriller that manoeuvres the reader through the suspense of being an impostor behind enemy lines, where even the slightest slip up could be your last. "I was a bit dubious when I started reading it, as I'm not a fan of war stories, but I was transfixed and had to keep reading to see how Tristan managed to survive = brilliant read." Self-made billionaire, Trevor Morrison, recounts his life from being a poor kid from a small town to creating one of the largest companies in the world, all before his 30th birthday. A true underdog tale is told in The Art of the Hustle. When Trevor Morrison graduated high school, he was desperate to find his purpose in life. With a lack of money and viable options at his disposal, he eagerly took advantage of the first opportunity to come his way. The harsh realities of the world were soon revealed as people who he thought he could trust betrayed him. The only thing that he could count on was his hustle - namely his wits and his insatiable desire to forge ahead despite a multitude of setbacks. Small towns talk, especially when a long-time resident dies mysteriously on the mountain bordering the sleepy village of Bon Resi. Sybil Deerborn, like any curious person, wants to know why a quiet older man who used to be a thriving member of the community was targeted. What makes it more troublesome is the carefully, yet disturbingly planned out threats against her life when she begins to investigate. With the appearance of an old acquaintance right around the time of the murder, who only seems to stir up trouble with every breath he takes, Sybil begins to wonder if maybe the murders are much closer to home than she anticipated. All of her evidence thus far points to one person, but no matter how close she gets to the truth, something leads her to believe there's more to this than what meets the eye. Throwing herself into the midst of a murder investigation maybe wasn't the best idea, but what does Sybil have to lose? One event after another, digging up secrets that were nothing but hearsay, Sybil realizes that perhaps she unearthed a secret far too dangerous for even her liking. But Sybil Deerborn is determined, and as some would say very stubborn. She won't stop until everything comes to light, even if it means risking her life to do so. For Sean McKinley, working in Albany PD Homicide is great except for one thing he's in love with his partner Sara Cain. And even though she feels the same way about him, she convinced him they should just remain friends. Two years later, nothing has changed. Yet, during the course of a murder investigation, when Sean finds out an old friend has died, it results in something that has the potential to change his life and Sara's forever. It goes to prove one unexpected act of kindness has the power to ripple throughout the years and bring happiness...even when The Day Job is Murder. Lady Aleana Brighton daughter of Marius Brighton Earl of Sumton. Described as an unruly, unteachable, and undisciplined girl. Stubborn in her ways, she refuses to marry. She is constantly the subject of gossip. James Wellington II. The eldest son of James Wellington I, Marquess of Stambridge, Earl of Sussex. Meaning he's an earl, heir to the marquess title, and heir to the considerable estates. But he's also a notorious gambler and drunk. Now they are engaged to be married. With high stakes they must learn to get along and function with high society. Will this explosive couple come out victorious? ** Wattpad Featured Story! ** A young girl arouses the wrath of an ancient Scottish water spirit who takes her brother's soul in revenge. To save him Brigid must journey through the Shadow realm, begging help and proving herself to each of the totem animal spirits of Britain. Steeped in British mythology and animal lore, The Shadowkeeper is a modern fairy tale written with animation in mind but could also be live action/CGI - lots of CGI! Back in 2005, The Shadowkeeper came heartbreakingly close to being sold to major production companies thanks to good showing in the three screenwriting competitions I submitted to*. A whirlwind trip to Hollywood for an awards night followed by meetings with managers and production companies had my little heart singing (literally one night, at an Etta James concert at the Hollywood Bowl!) Then reality hit. All of the feedback I received was the same: We love it but there's no audience for adventure stories with a female protagonist, change Brigid to a boy and we'll negotiate. Call me stubborn (the two managers offering me representation did) but I didn't think that was a legitimate "note", I thought it was simple sexism and I refused. Since then, The Shadowkeeper has been in the proverbial drawer but I love Brigid, I think she's a badass little eight year old and I've never given up on her. It's now ten years later and the attitude to female protagonists appears to be changing so I'm thinking of submitting The Shadowkeeper again but first I thought I'd pop it up here and see what  Wattpadders think. If you like it, I do hope you'll vote and/or comment to let me know whether you'd like to see it on the screen!